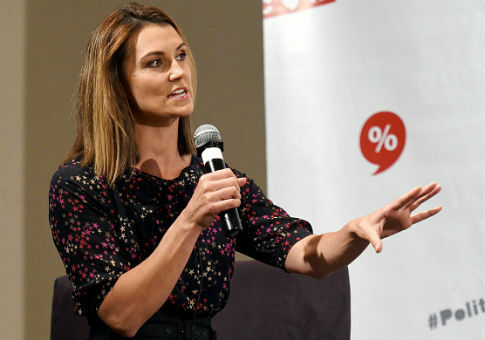 Prominent Democrats are cutting ties with a political action committee run by former MSNBC host Krystal Ball, complaining the PAC doesn't spend enough on actual candidates. The Washington Examiner first reported in February that less than three percent the People's House Project's funds were going to House candidates. By comparison, more than half of the $120,000 raised by Ball's PAC in 2017 was instead paid out to Ball herself as salary. Likewise, McClatchy DC reported Wednesday that the former congressional candidate had given herself an additional $104,000 in the first three months of 2018, bringing her total compensation up to $174,000. "That’s nearly eight times more than the nearly $22,000 the PHP has used to support its dozen endorsed candidates, some of whom have received just a single $1,000 contribution," McClatchy reported. PACs with lopsided salaries compared to expenditures are derisively called "scam PACs," with detractors arguing they're set up to enrich founders rather than to support causes. When McClatchy asked the People's House Project's prominent supporters with its findings, several prominent Democrats cut ties with the PAC. "As a donor to the People's House Project and someone who had hoped it would make a positive impact in getting candidates elected, I am as disappointed as anyone that so little of the money raised has made its way to candidates," Democratic Rep. Tim Ryan (Ohio) said. "I can no longer support this PAC." "Are you doing this because you want to improve the ability of Democratic candidates to win, or are you doing it because you want to make money?" remarked singer Clay Aiken, a runner-up in both American Idol and a 2014 North Carolina congressional race. He has requested Ball refund his donations. McClatchy said Ball responded to its report by calling the scrutiny "sexist" and saying "she was writing her own story about why male reporters were focusing on women’s salaries instead of men’s." She firmly disputes she has done anything improper. "This is my full-time work that I’ve put my heart and soul into and floated financially for a while," Ball said. "I’m extremely proud of and committed to the candidates that we try to serve." This entry was posted in Politics and tagged Krystal Ball. Bookmark the permalink.